Humans, the most adaptable species on the planet, have managed to occupy almost every environmental condition known to exist. Through human technology and adaptation, we have been able to manipulate local and global environments to the extent where it is possible for human habitation to occur. Reef City explores how we can adapt an existing technology for an architectural application, literally enabling the growth of cities underwater.With the global population increasing exponentially, and the imminent threat of significant land loss due to rising sea levels, it has become imperative to reconsider how we engage with the natural environment. Taking this attitude, we have questioned the necessity for humans to occupy the land, and instead propose the future occupation of marine environments. Reef City hopes to bring the potentials of this technology into current architectural discourse, while challenging the preconceived notion of what constitutes a city, all within an environmentally sustainable framework. 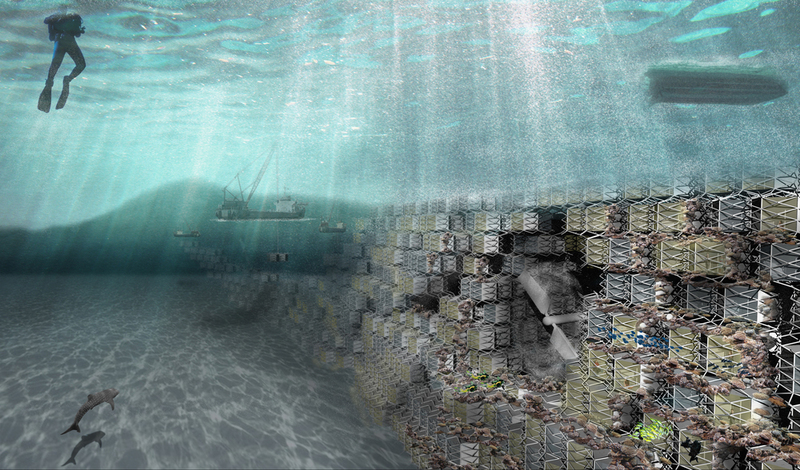 This project was created for the Jacques Rougerie Competition in the 'Architecture for the Sea' Category. It is a tangential extension from our initial studio project, Prototype: Reef CaCO3.